Act I Judas Iscariot, one of Jesus’s twelve disciples, is worried that the glorification as “King” that the masses of the poor are heaping upon the Master could well turn against him; he is running a risk of being labeled a fraud, or worse, being imprisoned (“Heaven on Their Minds”). Judas, unlike Jesus, sees their movement as essentially secular, dedicated to ending poverty. Jesus’s disciples are determined to go to Jerusalem and anxiously ask him when they expect to arrive there. Jesus counsels them to rest their minds: the future has been predetermined by God (“What’s the Buzz?”). Mary Magdalene, a prostitute, soothes Jesus’s irritation by anointing him with oil (“Everything’s Alright”). Judas objects to Jesus’s friendship with her (“Strange Thing Mystifying”), worried that it could put them all in jeopardy. Moreover, he feels that the expense of the ointment could have been put to better use in helping the poor. Jesus scolds Judas: unless he is himself without sin, he should not judge others. Judas resolves to seek help from the high priests, Annas and Caiaphas. The priests, however, think Jesus a threat to the Roman Empire and consequently to themselves, the Jews (“Jesus Must Die”). When Jesus and his followers arrive in Jerusalem (“Hosanna”), they are confronted by Caiaphas, who demands that the group disband. But it is impossible to quell the hysteria; the disciple Simon Zealotes recommends that Jesus lead his worshippers in a war against Rome (“Simon Zealotes”). Jesus rejects the suggestion, complaining that his disciples do not truly understand his message (“Poor Jerusalem”). Meanwhile the governor of Judea, Pontius Pilate, has had a dream of meeting with Jesus and of Jesus’s death, but is uncertain of its meaning (“Pilate’s Dream”). Jesus, at the temple in Jerusalem, finds its precincts used by sellers of weapons, drugs, and prostitutes (“The Temple”). Angry and tired, he is confronted by a mob of lepers, cripples, and beggars expecting to be healed; Jesus can do no more than tell the afflicted to heal themselves. Once again Mary Magdalene consoles him (“Everything’s Alright” – reprise). Jesus sleeps, and Mary reflects on the complexity of her feelings (“I Don’t Know How to Love Him”). Judas promises to help Annas and Caiphas deal with Jesus, insisting that his motives are unselfish (“Damned for All Time”). Offering some very convoluted justifications, they bribe Judas to reveal where Jesus will be on the following Thursday evening: the Garden of Gethsemane (“Blood Money”). Act II Jesus is dining with his disciples at what he realizes will be his Last Supper. Sharing bread and wine, he prophesies that one of their company will betray him to his death, and another deny his discipleship. Judas admits that he is the traitor, but Jesus dismisses him in peace and refuses to listen, which makes Judas furious. Judas goes in search of the Roman soldiers (“The Last Supper”). With his disciples sleeping around him, Jesus suffers agony in the Garden of “Gethsemane:” Why was he chosen to die for men’s sins? Will God not now spare the Lamb of God? God does not answer; Jesus is tempted to mock the Supreme Being for his unexplained motives. But ultimately Jesus submits to his Father’s will and resolves to go through with the plan. Judas arrives with the soldiers and singles Jesus out with a betraying kiss; Jesus is arrested. As the disciples awaken, they attempt to resist the soldiers, but Jesus compels them to put away their swords and surrender him to Caiaphas. Caiaphas in turn sends him before Pontius Pilate (“The Arrest”). The disciple Peter, meanwhile, warming himself by a fire, is confronted by an old man, a soldier, and a maid, each recalling that they have seen him with Jesus; to all three, Peter denies that he knows him (“Peter’s Denial”). Pontius Pilate asks Jesus, as Caiaphas had asked, if he is the Son of God, and receives the same answer: “You say.” Pilate, frustrated, sends him on to King Herod (“Pilate and Christ”). Jesus is dragged away, while the spectators jeeringly demand, “Where is your power now?” (“Hosanna” – reprise”). Herod, disappointed with Jesus’s failure to perform miracles on demand, sends him back to Pilate (“King Herod’s Song”). Mary and the disciples wistfully recall the origins of their movement, and wish that they could just begin over again (“Could We Start Again Please?”). Judas, riddled with guilt, goes again before the high priests, but receives no comfort from them. He blames God for making him the instrument of Jesus’s betrayal; he commits suicide and accuses God of his murder (“Judas’ Death”). At the trial, Pilate asks Jesus to defend himself, but Jesus will not. Pilate turns to the crowd: Would you crucify your “King”? They cry out: We have no King but Caesar! Suddenly Pilate recalls his dream, and argues that Jesus does not deserve to die, but the bloodthirsty crowd insists. Pilate hopes to satisfy them by flogging him with 39 lashes, but the crowd is still adamant. In an attempt to remove the guilt from himself, Pilate symbolically washes his hands (“Trial Before Pilate”). The questioning spirit of the dead Judas appears before Jesus at his crucifixion: Are you truly the Messiah? Was all this part of a divine plan? Did it happen for a good reason? (“Superstar”). Jesus slowly dies on the cross (“The Crucifixion”). An orchestral postlude ends the show, “John 19:41,” referring to the Biblical description of the tomb in the nearby garden where the body of Jesus was laid. A mixture of musical theater and vaudeville, sprinkled with rock accents, Jesus Christ Superstar was a revelation when it first premiered in 1972 as a studio recording and then as a full-fledged stage presentation. Since then, this work by Andrew Lloyd Webber and Tim Rice has become almost as legendary as its subject matter, even though its authors have taken many liberties with the story of Christ, as told in the Gospel of St. John, in their desire to give it a more contemporary spin. 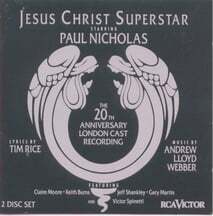 Done as a wide screen spectacular seen around the world, it has spawned many stage revivals, including a celebrated 20th Anniversary edition in London, that starred Paul Nicholas as Jesus, the role he had created in the original 1972 production. Find Sheet Music for Jesus Christ Superstar at Musicnotes.com. Click here!